A quick post to indicate that I, like so many others at this time, am reflecting on the year past. In this rambling, I want to mention up front that I end the year in a good place. I have work and am surrounded by wonderful family and friends. This year saw several transitions. The first deals with my goal to transition from a contract to a full time employee. Instead, that contract ended abruptly in April. Good people, solid products and a vision for future growth with an established industry leader. Score that as an opportunity missed due to mis-management by the client. Another transition was going back into job search. Having a solid network of contacts and a great reputation, I felt my chances were good to land quickly. As usual, things outside of my control dictated otherwise. So, I worked on refreshing my coding skills. A bit like bike riding and fell back into the developing mind set easily. It also improves my value add and increases my expertise in working with software developers. The final transition occurred after landing another contract gig as a project manager. I began commuting long distance as part of that change. Having tremendous family support made this transition easier. Could not have done this without them. That’s the highlights. Much more detail in between these transitions of course. Goodbye to 2013 and hello to 2014. I hope you had a good year and wish you success in the new year. Let me know how I can help and I will do the same. As the cell phone market matures, the major cell phone carriers are looking for ways to keep/increase revenue streams. We are witnessing this evolution in the latest move by AT&T to migrate away from unlimited data usage. If the usage based pricing model is successful, expect the other major carriers to follow with their own plans. Similar to pricing changes in the airline industry, this move will be watched closely by competitors and analysts. The NY Times has an article that talks about AT&T plan to use tiered pricing. It is not surprising that companies are looking to introduce usage based pricing plans. The carriers are seeing revenue streams plateau or even drop on the current pricing for phone plans. So, carriers see growing demand for data access and that can easily be converted to a revenue stream. Price points can be tricky though. How much is cloud access worth to you? What part of your disposable income are you willing to spend on getting email anywhere, anytime? Checking stock prices or sports scores? This is a clear signal that the market is sorting out and defining what types of consumers we are. There is no one data plan for all users. Think of business travelers, sales reps., soccer moms and college students – each has unique reasons to access the web for information. I expect there will be a price plan for each based on their needs and budget. I don’t take full advantage of the flat rate services I use. I know that and it’s OK. I favor the flat rate plan for service. It is predictable and a constant. It also is up to me to use the service as much, or, as little as I need it. My cable company provides a flat rate for video and I hope it stays that way. I know about cable offers with premium packages, like the NFL network. But, that is a niche, not the mass consumer. As this plan rolls out, people will become more aware of their usage for a short time. However, I don’t think usage rates will change much. In fact, the usage may increase as people find more ways to access the cloud to stay connected. On the technical side, I understand the argument but do not agree that a few users can ‘hog’ the bandwidth on the network. Come on AT&T, you’ve been in the network business a long time. You have automated processes and tools to balance and manage the traffic with equipment in the network that is smart and programmable. Routers and switches can be tuned to give priority to specific types of data packets. Load balancing is not just for the data center anymore and has been used in network management for a long time. I don’t buy the argument anymore that a few users impact the response rate for everyone. Even if less than 2% of your customers are ‘heavy traffic users’, the network response can be managed smarter. I hope folks managing data centers aren’t watching this and think it can be used with their service. Wouldn’t that be a change? I think it is an opportunity missed by the carriers. Network data usage is sporadic for most people; it is not a constant demand. There are peak times and I’m sure the trends on network demand are charted and known. Think business hours and prime time hours – there is a predictable level of usage and different parts of the network can be idle at times. The network is not routinely saturated at all points with traffic causing congestion and slow downs. We cannot use all the bandwidth provided 24X7. It comes down to capacity management based on demand aligned with load balancing. In our modern digital age, we have many choices on how to communicate. Saturated with choice, in fact. What if we didn’t have unlimited choice? What if words were rationed? How would that change how we communicate? Which brings me to Anguish Languish. Perhaps you’ve heard the story of ‘Ladle Rat Rotten Hut’ – the most common example. 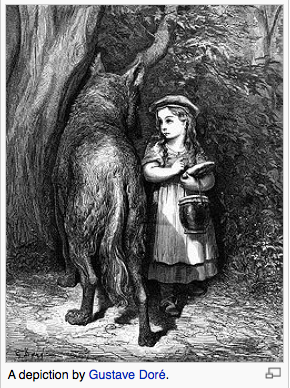 This is the story of Little Red Riding Hood re-told in the ‘Anguish Languish’ style. It demonstrates how important intonation is in spoken English. It also shows how versatile our language can be. It was written during WWII when many things were rationed to support the war effort. If words were rationed, perhaps, the story of Ladle Rat Rotten Hut would be common. It is easy to understand how certain words are used in place of the original. Example – reading ‘Water bag noise!’ instead of ‘What a big nose!’ If you don’t want to read the story, you can watch the video. I had read the story years ago posted in a newsgroup. Thanks to wikipedia, google and other available resources, lots of information on this topic is at our fingertips. Of course, we have no shortage on words. However, we do use Twitter and SMS text messaging even with their respective limitations. Tweets are confined to 140 characters – we willingly accept that. Both Twitter and text messaging encourages acronyms, abbreviations and, at times, some creative spelling. We accommodate those restrictions to convey our thoughts as succinctly as possible. They are not the most effecient forms of communications but their effectiveness cannot be denied. We all influence our language. It changes constantly and our ability to communicate will continue to evolve. Looking ahead, I anticipate using audio and visual images as easily as I can manipulate text today – a topic I have addressed previously. Until then, have fun with words. “Water bag ice! A nervous sausage bag ice!” Say it aloud. Better yet, have someone else say it. Know water mean?